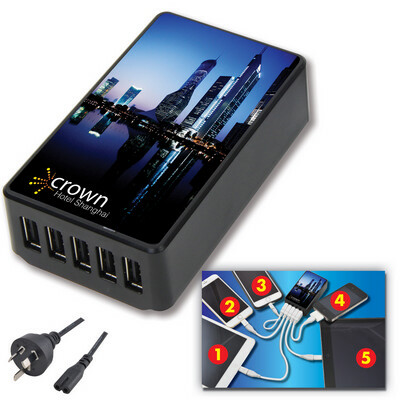 5 USB Port Wall Charger with SAA Australian standards compliance certification. Figure 8 mains power lead with 2 Pin Plug, 5V Output & each USB port capped at maximum of 2.4A by smart chip. Maximum combined output of all 5 ports is 7.8A. A must have for homes, offices, restaurants that charge multiple devices. Optional EVA black zippered pouch available at additional cost. Colours - Black Size - Charger: 93 x 26 x 55mm (LxHxD); Box 132 x 44 x 170mm (LxHxD) Decoration Area(s) - 4CP Digital Direct Print : Top - 88 x 50mm (LxH); Screen Print on EVA Case : LL6668 - Front/Back - 100 x 50mm (LxH); 4CP Digital Direct Print on EVA Case : LL6668 - Front/Back - 60 x 50mm (LxH).